Inflight GPS is designed to help you navigate through the air during your flights. 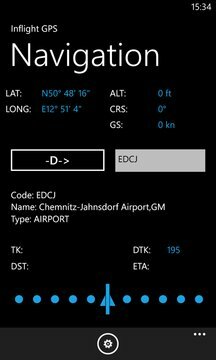 You can select your desired waypoint (VFR waypoints, airports including reporting points, VORs, NDBs) and the app will tell you the desired track to Destination, estimated arrival time and show your position relative to the desired track on a CDI (course deviation indicator). The CDI is in style of the famous KLN89 navigation device to get familiar with the app in short time. I disabled the lockscreen because it is annoying during flight navigation. Please keep that in mind and close the app if you don't need it. In later versions I will add the possibility to add waypoints to a flightplan. Currently only "direct to" navigation is supported. I added a trial mode which let you use the app for 5 minutes without further restrictions. Please let me know which navigation data I should add next or let me know if you have suggestions. Attention! This app can't be used as only Navigation aid during your flight. Always have a map onboard and use landmarks for your orientation. This app should only be a backup navigation aid for you. Fixed a bug with the CDI. Updated the navigation data download page and added some countries. It's now easier for me to add new navdata - just ask me!